The plant-based movement is attracting numerous emerging businesses. As a show of support, we have something very special at this year’s Summer Festival: the startup raffle. A stall will be raffled off to the most exciting new startup on the vegan scene. The only condition is that your company was founded in the last year. Register as a trade, gastronomy, or information stall. At the bottom of the registration form, you can indicate whether you want to take part in the raffle. We are looking forward to many new and exciting ideas being showcased at this year’s festival! Without the Orga team, nothing works at all at the Summer Festival! The team meets in advance to plan the Summer Festival. Each member has the opportunity to take on important tasks. On Thursday we’ll inform you about what’s going on and how you can get involved. The Vegan Summer Festival 2018 was once again a huge success – here you can see for youself. 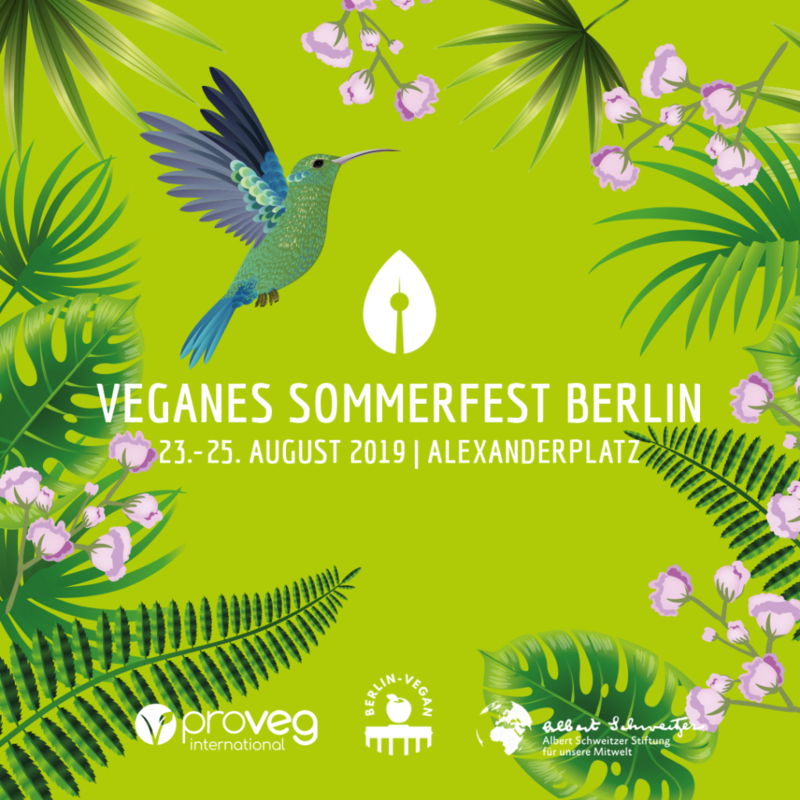 With 130 exhibitors and 65.000 visitors, the Alexanderplatz became a vegan island for tasty food. The lecture tent, ths stage, the new workshop tent and the Tattoo tent were able to inspire all. For more information about a plant-based lifestyle, the Ask a Vegan Stall and the Milch Stall made it possible. We thank all volunteers, sponsoring partners and all the others who supported the Vegan Summer Festival 2018. We hope you had as much fun as we had and would be glad to welcome you also at the Vegan Summer Festival in 2019. On Saturday, August 25th, after hearing her speak at the Veganes Sommerfest Berlin 2018 at 19:00, come watch Honey LaBronx, The Vegan Drag Queen (host of Big Fat Vegan Radio) lip sync for her life as a fundraiser for Veganes Sommerfest Berlin & Travestie für Deutschland! There is a €15 Suggested Donation at the door — cash and credit cards accepted, but it’s suggested you also bring extra cash to tip these queens during the show! And yeah, gurl — it’s a suggested donation. So pay what you can! The plan of site is ready! You are asking yourself, where which exhibitors are located. Here is the plan, so that you won’t get lost! This year, we have more than 130 exhibitors, and new tents for workshops and tattoos. And here you can find the plan of site. You can’t be better styled! Thanks to our great makeup artist Nora, our models are super stylish. Nora has specialised in vegan, animal-free and (if possible) bio make-up for over 5 years, she works with great enthusiasm in the most diverse areas, such as: Film, television, photography, events, private customers and much more. It is her great concern to show that you don’t have to cut back on pigmentation, easy handling, variety and fun in use….rather the opposite. The 11th Vegan Summer Festival 2018 is supported by many volunteers. There are many different tasks where we need YOUR help. It doesn’t matter whether you want to help for an hour, a day or the whole weekend. We are happy about every support! We also invited you to the volunteers meeting in the Genthiner Str. 48/ Berlin, 4th floor at the 25th if July at 18:30. You have questions? 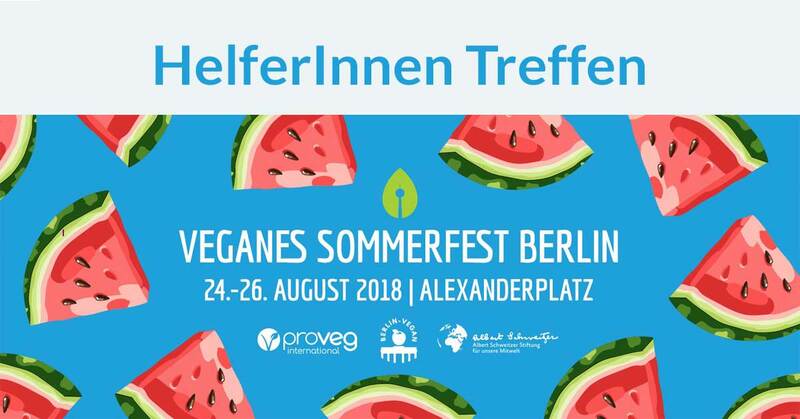 Please contact helfen[at]veganes-sommerfest-berlin.de. This year we have THREE novelties at the Vegan Summer Festival 2018: the workshop tent, the tattoo tent and the Vegan Summer Lounge! In the workshop tent it’s all about the action and you’re in demand. In small groups, you can craft, cook and discuss. You want a memory for life? Then the tattoo tent is the right place for you. Here small works of art are immortalized in your skin. One can totally relax at the Vegan Summer Lounge. With a cool drink, a comfortable seat and chilly music you can recharge your batteries for another round at the Summer Festival. You want to stand on the stage of the Vegan Summer Lounge or hold a workshop? Then contact us at mabel.killinger[at]proveg.com. We are looking forward to meeting you. 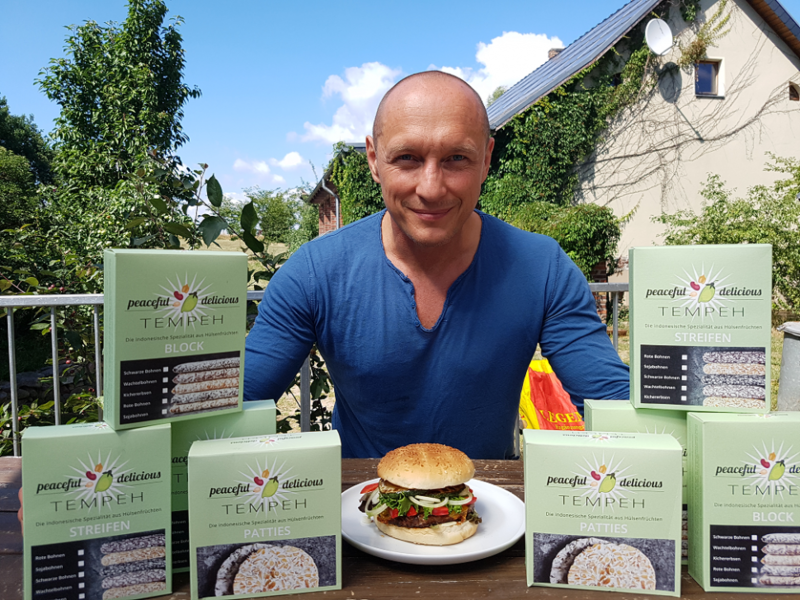 The winner of this year’s Sart-up Challenge is the tempeh producer Peaceful Delicious from Brandenburg and we look forward to welcoming them to our Summer Festival 2018! Peaceful Delicious makes fresh, handmade tempeh from various legumes such as soy, black beans, red beans, chickpeas and quail beans. The finished Tempeh is not only available in the classic block, but also in the form of stripes, sate sticks and burger patties. At their stall at our Summer Festival you can get different, freshly roasted Tempeh specialities. Come and see for yourself what Tempeh can be made of. Experience the tempeh diversity of Peaceful Delicious. As a summer party special there will be a soy/bear garlic tempeh with a great sauce.